This is my first try at using Hero Arts digital butterlies. It is inspired by Lucy's cards . I printed four card panels on one page, adding a sentiment. The butterflies were printed on various designer papers. I cut them out, distressed adges, added glossy accents on the wings and colored the bodies with pens. The papers are from DCWV and K&Company. Special thanks to Marina for the beautifully created digital sentiments which she shares for free on her blog. Two weeks ago I taught a class at a church retreat on how to make this card. I enjoyed it so much, so did the ladies! И легкие порхающие бабочки как любовь и счастье, которых боишься спугнуть! 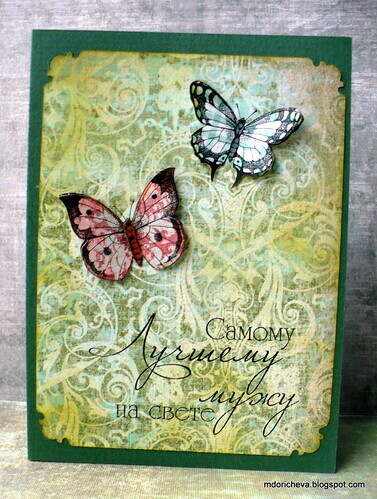 Such a pretty card...I love the butterflies.